I tend to get a bit negative sometimes, but I realize how important it is that I stay optimistic about things. A negative attitude doesn’t help anyone, and if I can stay positive about things then just maybe I will be able to make life easier for those around me. Here is to my new goal to stay positive! Wish me luck… or just pray for me! So….I am super cheesy, but I love word games and literary devices. I made a little game to play at meal times, and put it in a post called Literally Literary Lunch (I know, let me just load the cheese on). I wanted to make an alphabet soup recipe to go along with my post, and I wanted it to be a different version than the type you get in a can. A cheesy alphabet soup seemed to go right along with my game, so I came up with this recipe. Unfortunately, when I went to the store I was unable to find alphabet pasta, so I used macaroni instead. Whether or not you use alphabet pasta, or play my silly word game, this is a fun little soup to try out. 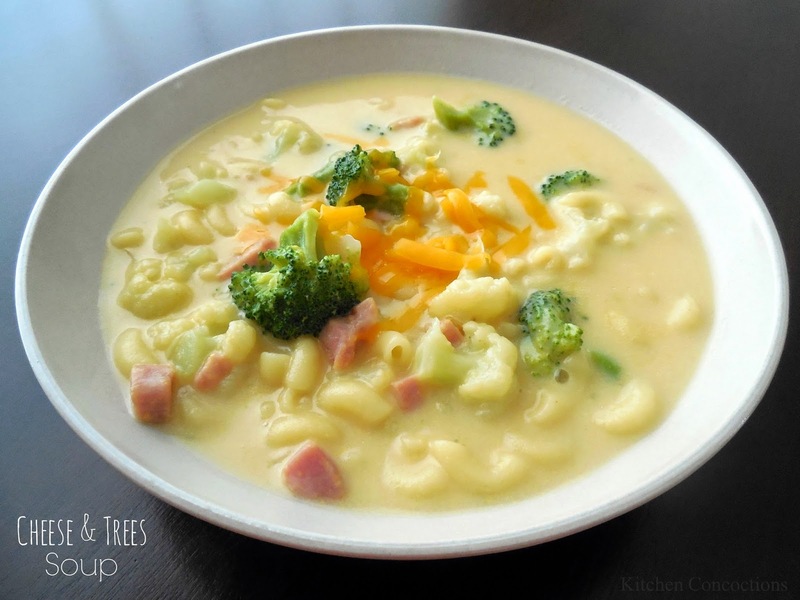 It is similar to macaroni and cheese, with a few extra little additions in it – namely ham, cauliflower and broccoli. Bring the chicken broth to a boil, over high heat. Add the macaroni and cook for 5 minutes. Add the cauliflower, broccoli and ham and cook for an additional 5 minutes. Meanwhile, combine the milk and flour and stir until there are no more lumps. Pour the milk mixture into the soup and reduce the heat to medium. Stir until the soup becomes thick and bubbly. Add the cheese and stir until melted. Allow the soup to cool for about 5 minutes before serving.